Have you wondered how Google manages to provide you with amazing search results in the first page? And how your website’s rankings fluctuate in position? With their quest to provide only the best and most credible results, Google’s knights in shining armour update their algorithms for an optimised experience. Small updates are common and happen daily with little impact to websites, but when Google makes a bigger update, everyone feels the shockwaves – whether good or bad. Major search updates are often discussed within the industry, with the most prominent algorithmic changes typically being named and released with an announcement. 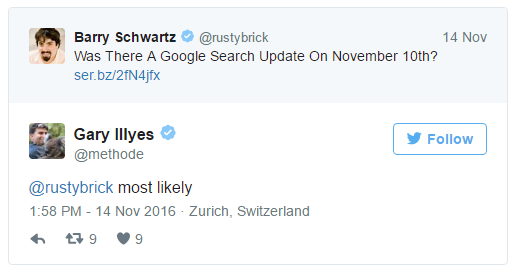 But did you know that on the days leading up to a big algorithm update, we can actually tell something’s on the way? And it’s not just because we’re a Google Premier Partner! Did you know that on the days leading up to a big algorithm update, we can actually tell something’s happening? With major algorithm updates, Google are known to make an announcement on their Webmaster Central Blog, causing everyone in the SEO world to take a deep breath with the knowledge that some major changes might be coming their way. Google announced when the update, Penguin 4.0, meant the famous link-related algorithm was now in real time and part of the core algorithm, which provided key changes to how websites are being analysed and ranked. However, Google can sometimes be evasive when directly asked about more regular search updates, as per the evidence of self-proclaimed “Chief of Sunshine and Happiness” at Google, Gary Illyes (he’s really a Webmaster Trends Analyst, but we understand the appeal of his given title). “Most likely” is about as close to a “yes” as we can hope for! 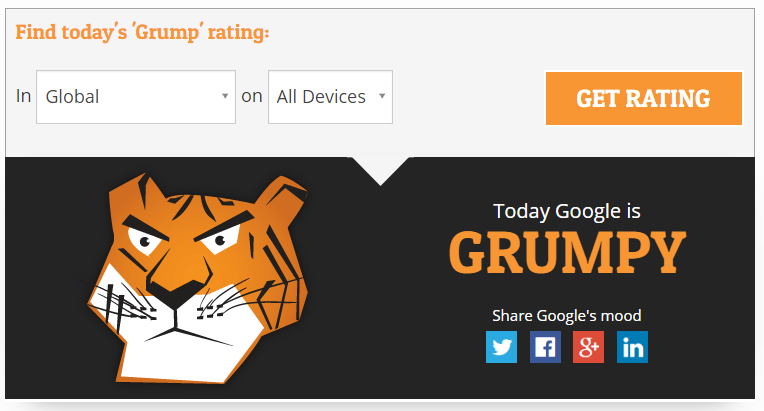 Google Grump is a feature on AccuRanker’s website that allows you to know the level of fluctuations in rankings. You can filter results by country (United States, United Kingdom, Australia, Netherlands, Denmark, Germany, and France) and by device (desktop or mobile). The mood swings represent every small change in the rankings, with four moods representing the level of alterations. Furious: The release of an algorithm update is highly likely, as the rankings are changing very quickly. Grumpy: Today’s mood, meaning that rankings are seeing a bigger change than usual. Cautious: It’s very likely that the mood is about to change, particularly if the days before have showed the mood moving up towards Furious. Chilled: The ‘lowest’ mood, in which nothing special is going on. This measure works through calculating an average of changes to the rankings over the top 100 results of 28,000 randomly-selected keywords. A comparison with the previous day is then made in order to provide a mood. Another great predictor of algorithm fluctuations is MozCast. It shows the fluctuations, or turbulence, happening in the Google algorithm. Like Google Grump, it’s quite easy to use: the stormier ‘the weather’, the more alterations to the rankings on Google. MozCast picks 1,000 keywords and the top 10 organic Google searches every 24 hours and compares them to the previous day’s top 10 results. They calculate the temperature of the current day by crunching data of all 1,000 keywords and then multiplying it by a fixed number, that is currently 28°F. The result? An average of about 70°F; anything above is indicative of possible impending changes. Google’s algorithms directly impact website rankings, a fact that our SEO Team are well aware of. As part of their very busy days, they keep up to date with industry chatter that helps to predict when times they are a-changing. When there’s a spike in temperature on MozCast, it becomes quite apparent that something is in the works, particularly when Dr. Pete of Moz is just as intrigued as you are! It’s important to understand when Google is about to remove the rabbit from the hat. It enables folks like us to get ahead of the game and respond to changes as and when they happen; but as long as you’re producing quality content, sourcing your links ethically and obeying the Google Webmaster Guidelines, then you really have nothing to worry about. But how can you be sure that the tactics you’re undertaking are going to keep you on the Google’s good-side? Well, why not give us a ring? Take as long as you want to predict what Google is up to: it’s still for nought if your content isn’t strong. Our digital marketing agency is on hand to ensure that whatever Google may throw at you, we’re there… working our magic. So, get in touch with our friendly team and find out just what we can do for you and your little slice of webspace.